Cruz said the deal is yet another example of the failure of the “so-called Republican majority” to deliver on their promises to the American people. “Nineteen times in the last ten months this so-called Republican majority has passed legislation, has had a vote succeed where a majority of Democrats supported it and a majority of Republicans opposed it,” Cruz added. “What does it say to you that a supposedly Republican majority of the United States Senate negotiates a bigger spending bill than Harry Reid and the Democrats?” Cruz asked. 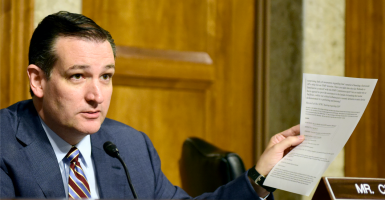 The budget deal “was not cooked up overnight,” Cruz argued. “The entire time Republican leaders have been promising, ‘We’re going to do something on the budget. We’re going to rein in the president,’ they have been in the back room negotiating to fund every single thing Obama did,” he said.